A playwright vacationing in Jamaica becomes dangerously obsessed with deep-sea diving Ron Grant is one of the finest playwrights of his generation, second only to Tennessee Williams in pure genius. But success does not mean he feels like a man. On vacation in Jamaica with his mistress, an ice queen who considers him her personal trophy, his thoughts are back in New York City, with a beautiful young girl he met a few days before he left town. As the stress bears down on him, the brilliant playwright goes nearly to pieces before he finds his salvation under water. On his first deep-sea dive, Grant falls in love with the haunting beauty of the reef. He returns as soon as he can, staying longer and swimming deeper until all his problems seep away. But a man can’t breathe underwater forever-and his obsession will drive him to take increasing risks that will change his life forever. 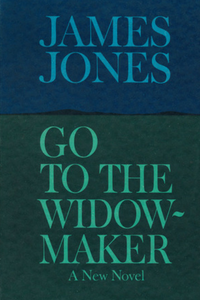 “In Go to the Widow-Maker . . . [Jones has] demonstrated his ability to create a remarkable novel of ordinary civilian life, of human relationships which are both typical and strange, of love and passion and pathology.” -Maxwell Geismar “One of the significant writers of his generation.” -The New York Times Book Review “The only one of my contemporaries who I felt had more talent than myself was James Jones. And he has also been the only writer of any time for whom I felt any love.” -Norman Mailer James Jones (1921-1977) was one of the most accomplished American authors of the World War II generation. He served in the U.S. Army from 1939 to 1945, and was present at the attack on Pearl Harbor as well as the battle for Guadalcanal, where he was decorated with a purple heart and bronze star.